Nearly four months into fiscal 2018, Congress has passed none of the dozen spending bills it’s theoretically supposed to enact every year. Instead, lawmakers are on their third stopgap measure, which keeps government operations funded until Jan. 19. Failure to enact full-year spending bills by that date – or, failing that, another short-term measure – would force big chunks of the federal government to shut down. The “standard” appropriations process, as laid out in the 1974 Congressional Budget Act, goes like this: After the president submits his budget proposal, the House and Senate adopt their own budget resolution. While it doesn’t have the force of law, the budget resolution sets out the overall spending framework for the coming fiscal year and serves to guide lawmakers as they address specific tax and spending decisions. But agreeing on a budget resolution has itself often proven problematic. Although the Congressional Budget Act establishes April 15 as the target date, Congress frequently misses that deadline (this year, for example, the resolution wasn’t agreed to till Oct. 26) – or, as in six of the seven most recent fiscal years, never adopts a formal budget resolution at all. Next, Congress is supposed to pass a series of separate bills funding various agencies and activities of the federal government. (For the past decade, the number of spending bills has stood at 12, one for each subcommittee of the House and Senate appropriations committees.) The deadline for doing that is Oct. 1, when the new fiscal year starts. But since 1997, Congress has never passed more than a third of its regular appropriations bills on time, and usually has done considerably less than that: For instance, for six straight years (fiscal 2011 through 2016), not a single spending bill was passed by Oct. 1. 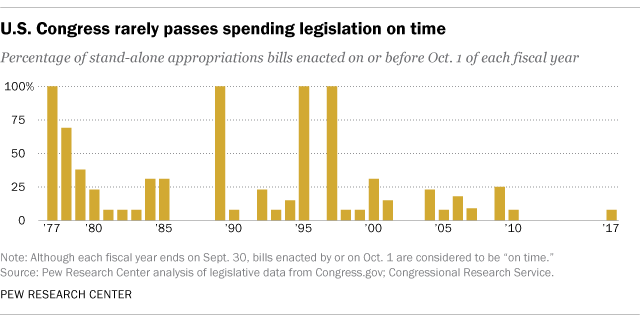 Instead, Congress increasingly has bought itself more time by relying on continuing resolutions, or CRs. CRs typically extend previous funding levels but only for existing programs; they’ve lasted as little as one day and as long as the rest of the fiscal year (a “full-year CR”). Since fiscal 1997, the general trend has been for the appropriations process to drag out longer and longer: The time between the start of each fiscal year and the date that year’s final spending bill became law has grown from 56 days in fiscal 1998 to 216 in fiscal 2017. And rather than pass stand-alone spending bills as it’s supposed to, Congress has increasingly used omnibus bills (which bundle several appropriations measures into a single, giant law) and full-year CRs to resolve annual spending disputes. The first such omnibus measure was passed in 1950 as a one-off experiment, and omnibus spending bills were used a couple of times in the mid-1980s. However, they’ve become much more frequent in the past two decades: In each of the past seven fiscal years, in fact, all or nearly all of the regular appropriations bills were combined into such after-deadline package deals. 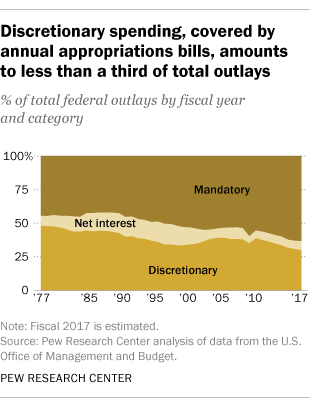 For all the energy that goes into the annual appropriations process and all the attention it attracts, it covers less than a third of all federal spending. If a deadline passes without either a new set of spending bills or another CR to fund the government, operations considered nonessential would be forced to shut down. In a lengthy shutdown, as occurred in October 2013, applications for things like drilling permits, small-business loans and export licenses might not be processed; museums and national parks might have to close; government statistical reports could be delayed; and hundreds of thousands of federal workers could be furloughed. (During the 2013 shutdown, some 800,000 federal workers were furloughed while 1.3 million others had to stay on the job without knowing when they’d be paid.) But mail would still be delivered, Social Security payments would be made, and workers deemed essential to protecting life or property (such as air traffic controllers and personnel at veterans’ hospitals) would still get paid.